Database Connector is a module that gives cab printers directly access to external databases through TCP/IP. 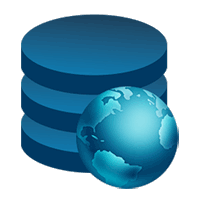 It is possible, for the same label, to access simultaneously multiple tables in the database. Similarly, several printers are accessing the same database and this simultaneously, thus ensuring data consistency. It provides access to any type of database through an ODBC (Open Database Connectivity) or ADO (ActiveX Data Object) driver. At TFL various chemical containers are labeled with Hermes C systems.